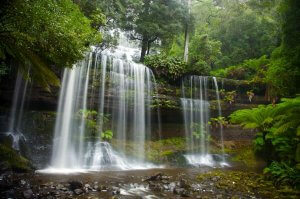 Discover pristine waterfalls of the island state Tasmania. Tasmania defies Australia's well-earned reputation as a dry desert full of creepy crawlies. Instead, this island state has broken off of mainland Australia to sit right in the teeth of the Roaring Forties. The churning weather system spans across the Southern Hemisphere and brings the freshest air in the world to Tasmania, as well as abundant rains. The confluence of wind and rain carves pristine waterfalls into the landscape of the Natural State. 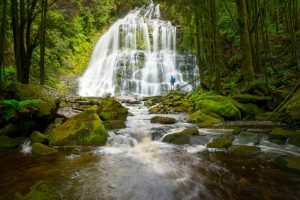 Add that to the fact that large swaths of the Tasmanian island are protected -- utterly untouched by mankind -- and you have a recipe for some of the most rugged, wild and beautiful waterfalls in the world. And they're all just waiting for you to discover. Here are just some of Tasmania's best waterfalls. Image thanks to Dietmar Kahles. 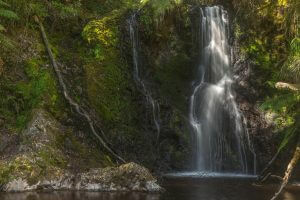 This single-drop waterfall can be found near the town of Moina on a four-wheel-drive track. There's plenty of signage that will bring you to the falls, which are a beautiful cascade. It stands 21 metres tall, but the height is not the standout feature. This wide waterfall carries plenty of water on its 21-metre drop with a strong rectangular shape. There's a hard dolerite backdrop to this fall which allows the water to splash, cascade and branch as it descends to create the illusion of a see-through bridal veil. Imagethanks to Tourism Tasmania & Kelly Slater. 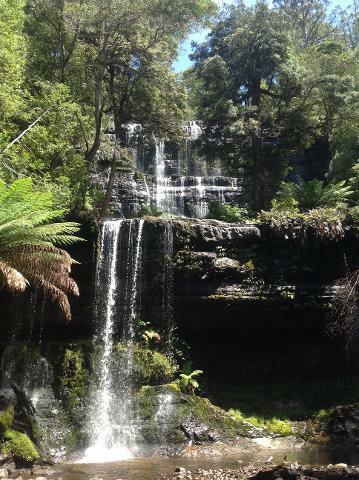 Found in Mount Field National Park, this stunning waterfall is just an hour's drive from Hobart. It's so beautiful that it serves as the centre attraction of this rugged National Park. You'll have to take a 20-minute nature walk on a flat boardwalk through a temperate rain forest surrounded by swamp gums, dogwood musk and myrtle. 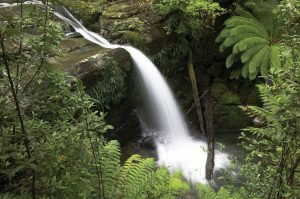 The walk will bring you to the base of Russell Falls which cascades mightily over a giant staircase of hard dolerite. The shattered rocks and tree stumps at the base of the falls make the power of the water all the more impressive. 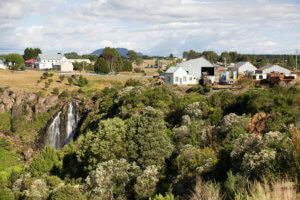 Just 30 kilometres from Deloraine, you'll find the town of Liffey with its impressive waterfall. The Liffey River Waterway steps down multiple tiers to create a 4-part cascading waterfall. It's a 25-minute walk from the upper carpark along a well-maintained walking trail. This is an incredibly popular tourist area so the trail is full of informational displays. Once you get to the waterfall, you'll find several viewing platforms and you'll run into plenty of people. But don't let the crowds diminish your enjoyment of the falls. With the moss covered rocks and towering rainforests surrounding the falls, it's almost better to come here when rainy and foggy as the colours can be more striking. Image thanks to Tourism Tasmania & Geoffrey Lea. Driving to the northwest Tasmanian town of Waratah, it's nearly impossible to ignore the town's towering waterfall. These falls can be seen from many different vantage points in town and you can also hike to the base of these massive falls. The water cascades from a towering cliff so you'll have to crane your neck to see the entirety of its majesty. The water seems to pour through some of the cliff's thick vegetation before splashing down in a gully below. This 50-metre waterfall drops stunningly into a pristine blue pool inside a massive gorge. Pouring its water near Lake Leake, this Cygnet River falls is a part of the Meetus Falls Forest Reserve. A carpark area with barbecues and toilet facilities is where you'll find the short trail down to a viewing platform of the valley below. You'll get panoramic views of the stunning gorge that's worthy of your best social media picture. You'll also find a smaller track bends off the main track to take you to a rocky river bottom real find smaller cascading falls. This waterfall stands at a staggering 114 metres high. You'll find it just a few kilometres past the picturesque town of the same name. The trailhead's carpark has no facilities and you're going to have to earn the right to see this waterfall on a medium difficulty trail. The first 20 minutes of the walk is easy before the trail splits and begins to undulate through gullies. You'll eventually leave the forest as the trail becomes much rockier before being exposed to some drop-offs. You'll find a well-defined lookout from a wooden porch that's perfect for a picnic. During low flow, you can take the breakaway trail down to the river below. And, for the adventurous, you can rock scramble up to the base of the falls. Nelson Falls resembles an ancient temple. The cliffside that creates this stunning waterfall is seemingly etched with steps that make it look like the side of a Mayan pyramid. An easy walk along a well-defined boardwalk takes you to the base of these falls where you can gaze upwards at its beauty. You'll find this waterfall about 30 kilometres east of Queenstown on the Lyell Highway. It's worth a stop to stretch your legs on a drive to Tasmania's rugged west coast. Image thanks to Paul Fleming. St. Columba Falls does not pour over a dramatic cliffside. Rather, the waters cascade down a series of well-graded hills while pouring in the and out of rocky pools. This multi-tiered delight can be seen after a moderate uphill walk. 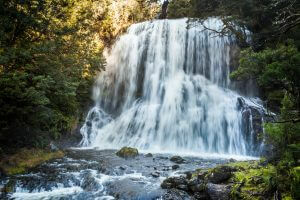 You can find these falls off the Tasman Highway on your way to St. Helens. Image thanks to Pierre Destribats. 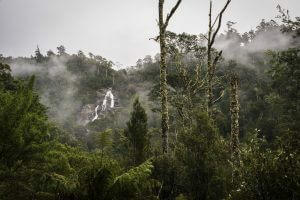 Montezuma Falls is one of the tallest waterfalls in all of Tasmania. Standing at an impressive 104 metres, this waterfall cascades down a very narrow track. It almost as though it's designed to be a waterslide jutting out from the cliffs around it. You'll have to walk a few hours return to catch a glimpse of this amazing fall on a rather easy track. 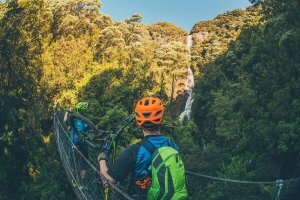 You'll wind through rainforest surrounded by sassafras, myrtle, leatherwood and giant ferns all while several species of bird whistle tunes overhead. At the base of the falls, you'll find the ruins of a 160-foot bridge that once stood 50 feet high. Head to Waterfall Bay to find the unnamed waterfall that gives this bay its name. What makes this waterfall so alluring is the fact that it is difficult to see. There is a well-made lookout but the view is quite distant. If you want to get up close and personal with this towering fall, you'll have to jump aboard a ship. 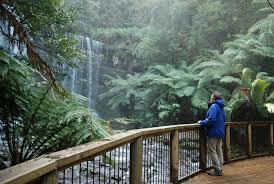 A cruise to Tasman Island brings you right to the base of these falls that pour into the deep blue ocean.